Christmas is almost here! And I don't know about your home, but in mine, the excitement is all around! We absolutely, positively love the holidays! We love the lights we love the music... we love it all. But perhaps my most favorite thing about the Christmas season is the tradition of it all. When we take a look back throughout the years we see that many things in our lives have changed. We've gotten new careers, we've moved, our children have grown older...as have we. But when it comes to the holidays, so many things always remain the same. Maybe it's the annual family trip to spend the holidays together as a family. Maybe it's a traditional meal that you eat each year, no matter where life takes you. Maybe it's traditions like Elf of the Shelf, or writing letters to Santa. Christmas Mass, caroling, holiday parties...everywhere we look Christmas is surrounded by traditions. In my family, like so many others, these are Christmas staples. We have seen them again and again and never tire of watching. We have grown up with them ourselves, and have introduced our children to them now. I don't have to tell you what these movies are all about, or why they are so great...you already know! 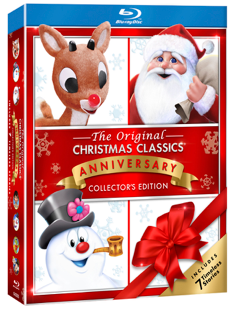 But these anniversary editions do bring some fresh new fun to the table with all new bonus features! They allow us to take a behind the scenes look at all our favorites! They let us sing and have fun and get in the Christmas spirit with fun holiday sing-a-longs. And perhaps our favorite part, we are even able to learn how to draw our favorite characters from these beloved tales! The movies are great all by themselves, but these fun features take our holiday celebrations to the next level! What are you waiting for!? Pick up your gift set today! Ready for even more fun? Click the buttons below for more fun & games! These are truly my favorite and always will be!! They remind me of my childhood :) Back when things were simple!